Located in southwest Michigan, Big Bear Products has been building and selling quality constructed hunting/fishing seats for years. As avid hunters and fishing enthusiasts, we are concerned with the safety, comfort and function of our products. The Homer Leblanc Original that took the Muskie world by storm has been adapted for saltwater fishing, with rave reviews. Same design, but with different colorings and hardware updated to withstand the demands of the saltwater environment. These baits are working, and are already starting to make a name for themselves and those that fish wit them! Designed in 1956, the "Swim Whizz" has two depth settings to pinpoint your presentation. The jointed model has three hooks while the straight versions use two large trebles and have internal rattles! 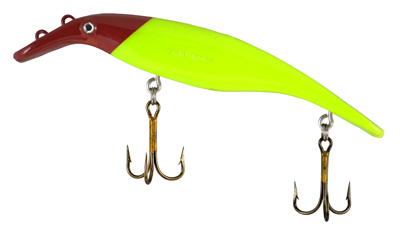 These lures have been copied by many other companies but none equal the original. 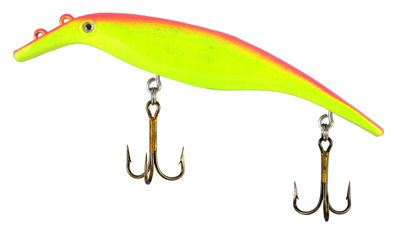 Today, Homer LeBlanc's "Swim Whizz" lure design still outperforms other lures on the market, some 50 years after their introduction to the general public. Current verions include a 6" & 8" straight lure, as well as an 8" jointed version. For information on purchasing these lures, please contact us directly for current size and color availability. Big Bear Products has been making and selling specialty hunting products for over 14 years, concentrating on items that are useful, reliable and practical. 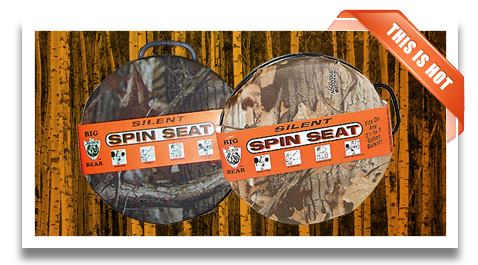 By far, the Spin Seat and 3/4 Ice Seat have been our most popular product, with over 750,000 seats out there, being used year after year. Interested in our products? Please contact us about purchasing options. Retailers are welcomed.